Is it possible to send a note and a gift all in one little envelope? 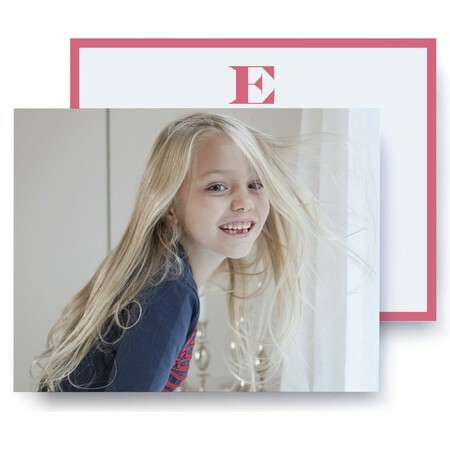 It is when you send personalized photo monogram stationery from Pinhole Press. Monogram stationery is the essence of elegance, but add a photo of your baby, child, family, wedding, holiday event or another meaningful subject, and your stationery takes on a whole new meaning. Your loved ones, whether it's Grandma and Grandpa, aunts, uncles, cousins or much-loved friends, receive a frame-ready picture to treasure along with your personal note. Monogram stationery is 5.5 inches by 4.25 inches and printed on ultra white premium paper for a rich image. Each set arrives with lovely A2 superfine ultra white, eggshell finish envelopes for an added touch of style. Your cherished frame-ready picture adorns the front of each card. A simple and elegant personalized note adorns the back. Choose a favorite photo, select your favorite color for the text and border and sit back and imagine the smiles.